"Expert Internet Marketer Reveals To You A Short Cut To Rapidly Increasing Your Back links, Market Reach, and Ranking High in Google and Yahoo Quicker Than Ever"
You'll learn tricks on how to get into Yahoo and Google News within less than a day...and I'm not joking...From then on, you'll learn how to boost your rankings even further so you can kick out your competition who worked months to get the top rankings that they have. You see...press releases are much more than news pieces. In order to produce sales, you need to increase the awareness of your product or service. You can take it one step further and promote an affiliate product. Or you can use it to build your list and increase a large amount of back links. So Are you REALLY serious about taking control of increasing your targeted traffic by developing a better marketing plan? 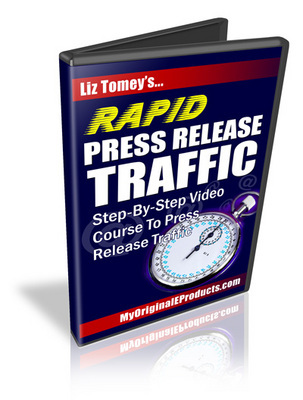 In these videos, you'll learn the shortcuts you need to get your Press Release marketing plan up and running. The videos are straight to the point because who wants long videos that go on and on; and end up wasting your time? You'll get access to a list of press release sites that produce results.